The word genius is tacked on to a lot of recipes these days, but in my mind genius in the kitchen is equal to simplicity. It’s always the hardest thing to do. So when a recipe can be broken down in ever more simple ways, I think that’s genius. Take this dish: I had it at San Francisco Cooking School when the graduating students created a restaurant-worthy meal for family and friends. Since they were showing off their new skills, they made each element from scratch — snowy white meringues, intensely strawberry strawberry ice cream — then artfully arranged them with sugared berries on a plate. Every bite was perfectly balanced between creamy and crisp, sugary and tart, ice cold and room temp. I asked for the ice cream recipe and it came from here. The meringues I could make from my own recipe, without the chocolate. Then I realized…wait, I can do this without making anything! I can buy great strawberry ice cream and meringue stars and sugar up berries in minutes (sweeten only the strawberries so they create their own sauce). I can make it for Mother’s Day or any day now that berries are back in season. It’s just a matter of putting the pieces together in a new way and it took the geniuses at the cooking school to show me that. Hull strawberries and cut into quarters. In a bowl, mix strawberries with granulated sugar and let stand until juicy, about 10 minutes. Cut each cookie in half with a sharp knife. 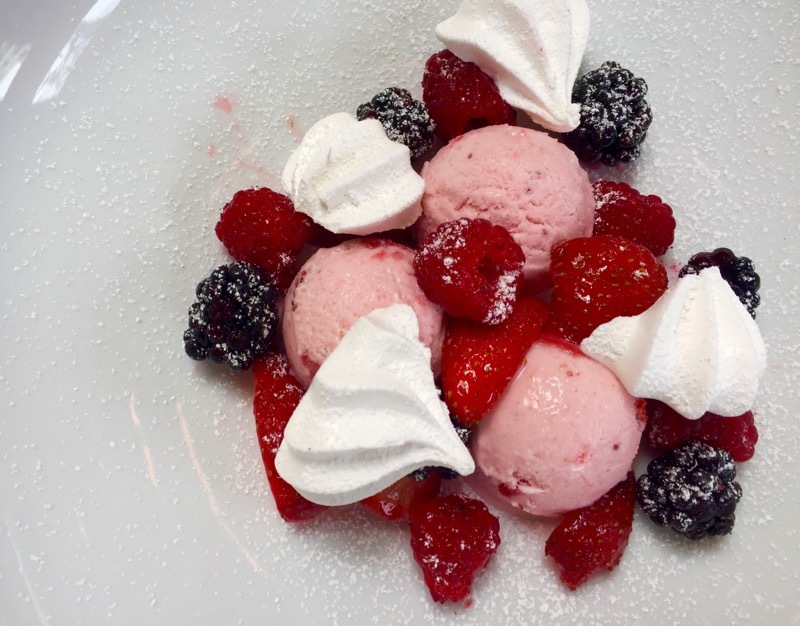 On each of 6 chilled dessert plates, arrange 3 small scoops of ice cream then spoon over some sugared strawberries and a few raspberries and blackberries. Divide the meringue halves among the plates, arranging decoratively (4 per plate). Dust with powdered sugar if desired and serve immediately.